Just like previous versions of Windows, Windows 10 allows you to create a password reset disk from within the Control Panel. But when you try to click on the “Create a password reset disk” link, you might find out nothing happens. No wizard. No response at all. Doesn’t matter if I have a USB drive plugged in or not. After searching online we find out this is really a bug in Windows 10. Here’s how do I troubleshoot this problem. 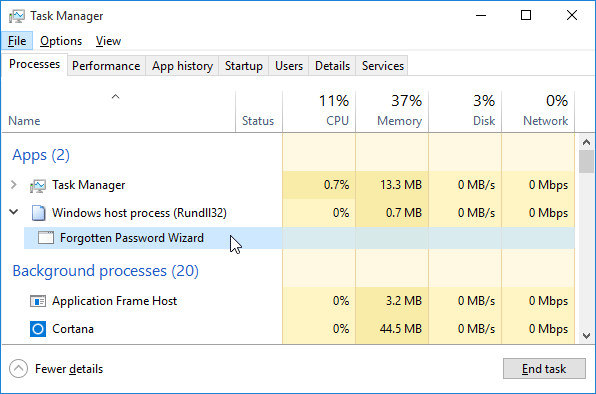 Actually, after clicking the “Create a password reset disk” link, the Forgotten Password Wizard will appear in the task switcher window (Press Alt+Tab keys together lets you open the task switcher window for switching between your running apps). But when I tab over to that task and let go of the keys nothing displays. Method 1: Move your mouse cursor to the top-right corner of the Forgotten Password Wizard in the task switcher window, it will display the X button. Just click on X to close the process. 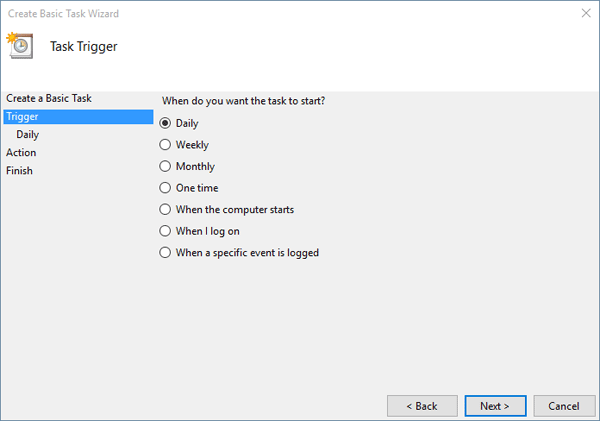 Method 2: Press the key combination CTRL+SHIFT+ESC to open the Task Manager directly. Find out the process named “Forgotten Password Wizard”. Select it and click on End task. After close the Forgotten Password Wizard process. Re-click on the “Create a password reset disk” from within the Control Panel, it will open the Forgotten Password Wizard successfully. 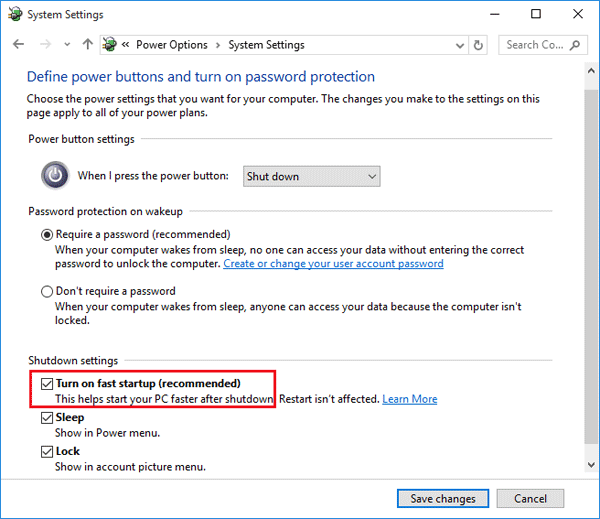 How to enable / disable fast startup in Windows 10? 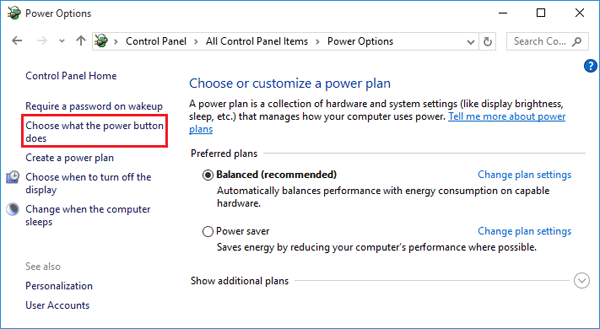 The “Turn on fast startup (recommended)” option is missing from the Power Options? Fast Startup is a new feature of Windows 10/8, that allows a computer to boot faster than before. This article will explain how the Fast Startup works and walk you through the steps to turn on / off Fast Startup missing in Windows 10. When you shutdown a PC with Fast Startup turned on, Windows saves the current system state and the contents of memory to a file called hiberfil.sys and then it shuts down the computer. Later, when you turn on the computer, rather than performing a full load of the entire system, Windows reads only the contents of the hiberfil.sys and then restores the system state and memory to the exact same condition they were in. This restoration operation can occur much faster than a computer can boot up from a complete shut down. 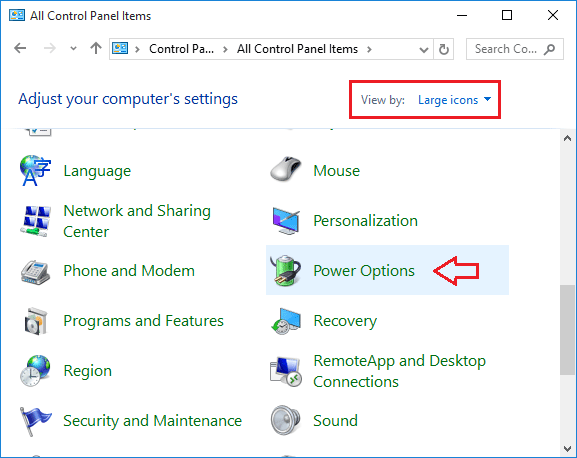 How to Turn On or Off Fast Startup Missing in Windows 10? Press the Windows logo key + X on your keyboard and then select Control Panel from the drop-down menu. When you go to the control panel it shows up as the “Category” view option by default. Switch it to “Large icons” then click Power Options. Click on the “Choose what the power button does” link on the left side. By default, the Shutdown settings options are greyed out. Click on “Change settings that are currently unavailable” to unlock the greyed out options. Now you can check / uncheck the “Turn on fast startup option” to enable / disable the fast startup feature. Click Save changes button. Done! Fast Startup Missing from the Power Options window? Press the Windows logo key + X on your keyboard and then select “Command Prompt (Admin)“. Close the Command Prompt window and then re-open the Control Panel. Fast Startup should be there now. Sometimes you might want to schedule Windows to shutdown automatically after a specified amount of time. For example, let’s say you’re downloading a big file at night. You know it will take about one hour for it to be complete, but it’s too late and you must sleep now. You don’t want to leave your laptop running overnight. 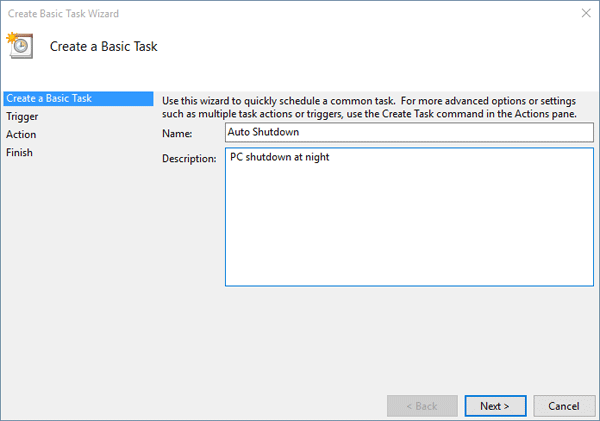 Here I’ll show you 2 methods to set up auto shutdown in Windows 10 and 8, and instruct your computer to automatically shutdown after a given amount of time, or at a specified time. Press the Windows key + X opens the Quick Access Menu. Click on Command Prompt (Admin). 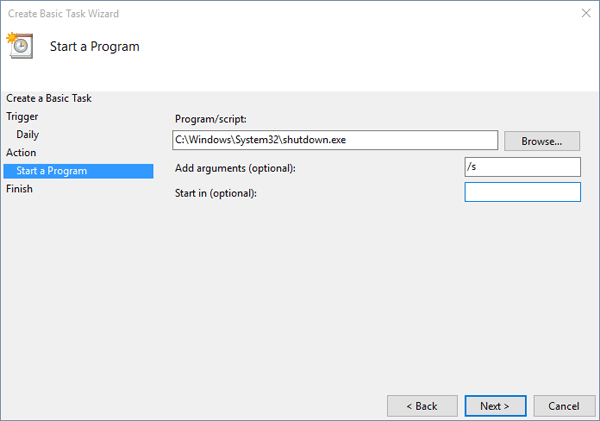 Once you execute the command above, the system will force close all running applications and shutdown after 2 minutes. 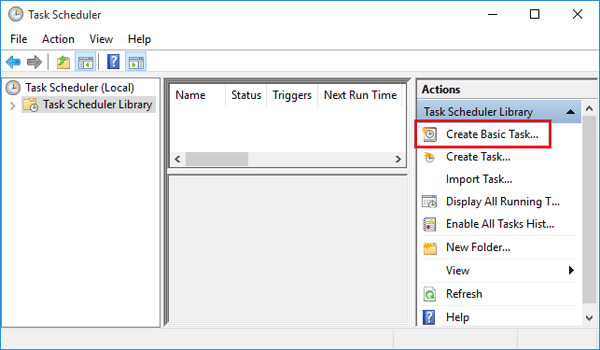 You’ll need to open up Task Scheduler to create a schedule task. Press the Windows key + R and type taskschd.msc in the Run box. 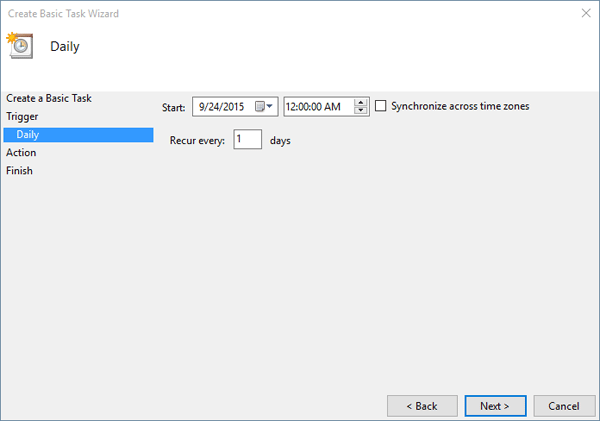 The Task Scheduler window will come up. 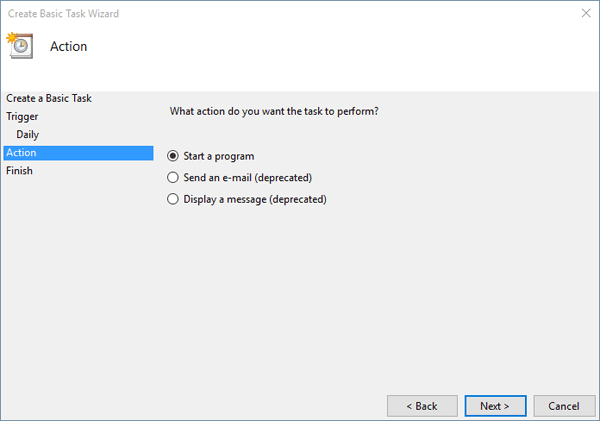 Select Create Basic Task from the Actions panel on the right. Enter a meaningful name and description of the task you are going to create, and then click on Next. Select the radio button “Daily” and click on Next to continue. Now enter the starting date and time. Also, make sure that you are choosing for the task to reoccur every day. Select the radio button “Start a program” and click on Next. 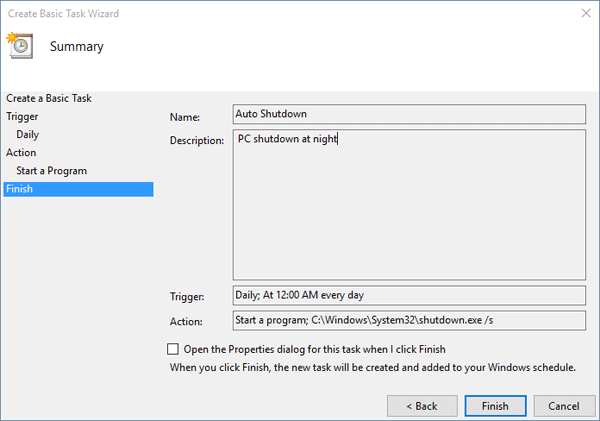 Click on Browse button to locate shutdown.exe under the system folder c:\windows\system32. Enter /s as the application argument which forces your Windows computer to shut down. Go through the summary, and if everything is fine, click on Finish. Now you have successfully configured the automatic shutdown at night. Have you set up a PIN login on your computer but forgot the PIN code? 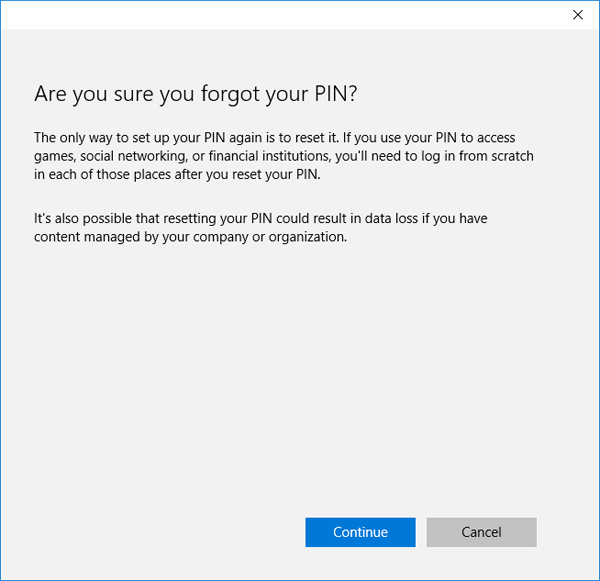 PIN is a convenient way for tablet users to log into Windows 10 without typing complicated password. This is really helpful especially if your tablet is not connected to a keyboard. 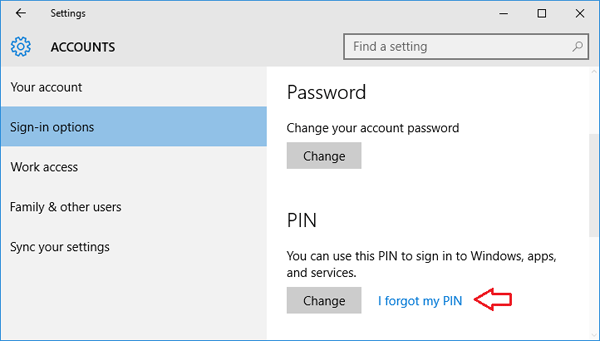 If you’ve forgotten Windows 10 PIN, you can reset / remove it easily so long as you can log on with an alternative sign-in option – local account or Microsoft account. 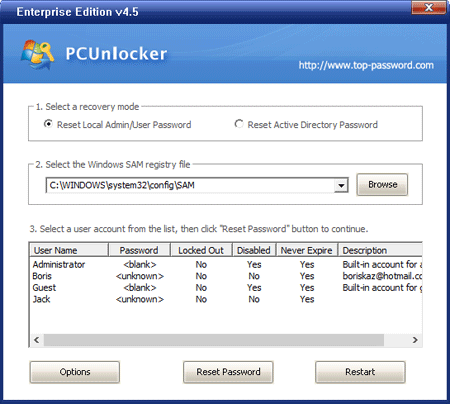 Note: If you’re completely locked out of your Windows 10 PC and can’t login with any sign-in option, try to use PCUnlocker to reset your forgotten passwords of local / Microsoft account. How to Reset or Remove Forgotten PIN in Windows 10? Click on the Windows icon in the left-hand corner of your screen, you’ll open up the Start menu. Next click on Settings. When the Settings app opens, click on Accounts. Click on Sign-in options on the left pane. Under the PIN section, click on the “I forgot my PIN” link. The password reset procedures differ between Microsoft account and local account. If you’re using a local account, Windows will prompt you to verify your local account password. Enter your password and click OK.
You’re now prompted to set up PIN again. Enter 4 digit number for your new PIN login and click OK. If you want to remove and disable the PIN, click Cancel. 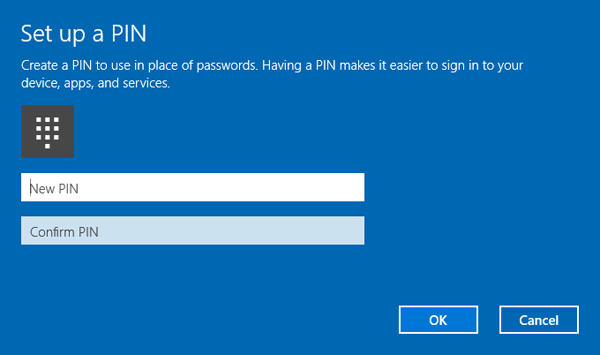 If you PIN is for a Microsoft account, you’ll see this confirmation dialog. Click Continue to confirm that you really forgot your PIN. 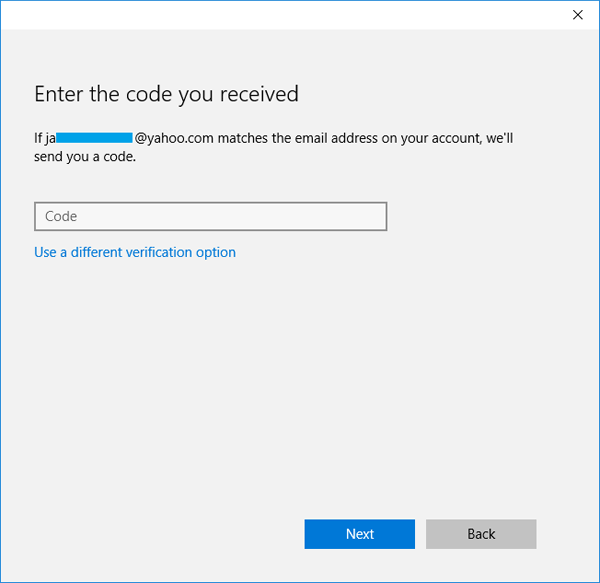 Microsoft will send you a security code to validate that you are the owner of the Microsoft account. Enter the recovery email address for verification and click on Next. Check your email account and look for a message from Microsoft account team. Copy the security code from the mail and paste it in the Code text box. Click on Next. Now you can either set up a new PIN or click Cancel to disable/remove the PIN login completely. 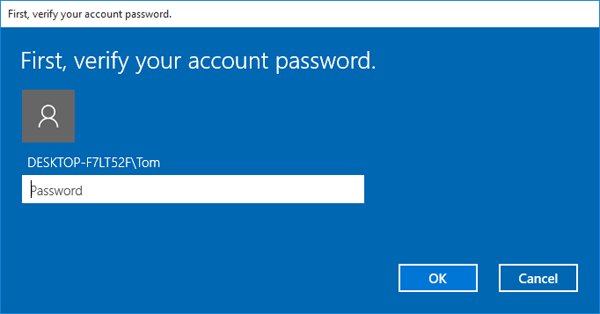 Forgot your Microsoft account password and Windows 10 login screen kept telling you the password is incorrect? 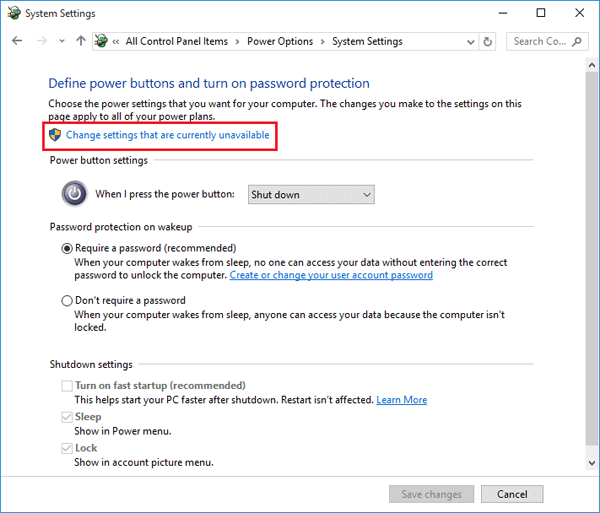 Looking for a way to reset Windows 10 Microsoft account password so you can get back access to your files? The credentials of Microsoft account are stored in Microsoft’s cloud, so if you forgot the password you can use Microsoft’s online password reset page to reset your password easily. However, if you’re unable to pass the security checks from Microsoft’s online form, that method won’t work. 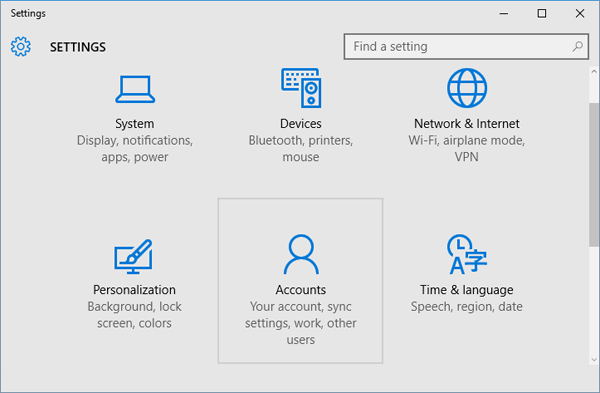 In this tutorial we’ll show you another way to log back into Windows 10 by offline switching your Microsoft account to local account. The procedure can be divided into 4 parts. As you’re already locked out of Windows 10 PC, you have to use another computer to make a boot CD. Download the CD image (trial version) of PCUnlocker and save it to any folder on your local hard drive, then use the freeware ISO2Disc to burn the ISO file to a blank CD (or USB thumb drive). After booting successfully from the CD, you’ll be taken to the PCUnlocker program. From there you will see a list of all the local accounts available on your computer. 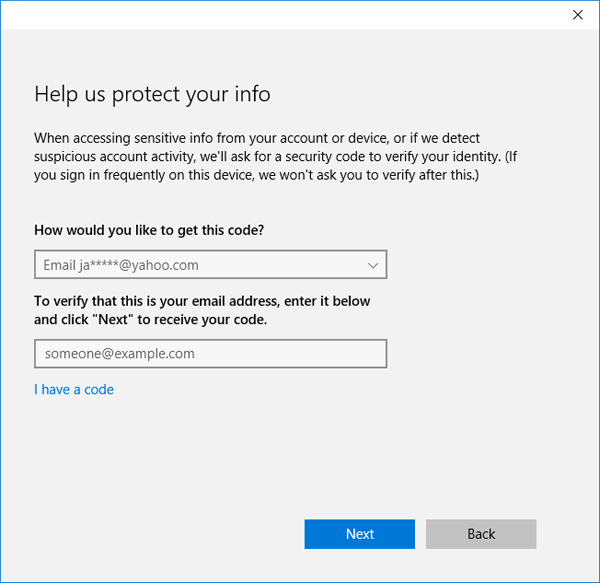 Please note that one of your local accounts was automatically associated with your Microsoft account, and you’ll find out your email address displayed under the Description column. Select the associated local account and click on “Reset Password” button. The program will switch your Microsoft account to local account and afterwards reset the local user password. Take out the CD and reboot your computer. When it boots to Windows 10, you can see the underlying local account shown at the login screen. Click on that account and you can login without typing a password! Once logging in, you can access any local files associated with your previous Microsoft account.